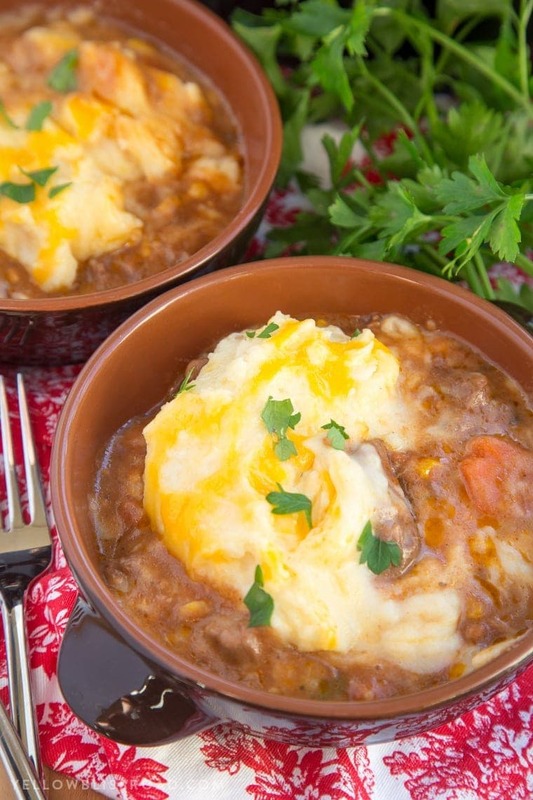 This Slow Cooker Shepherd’s Pie, is rich and delicious and full of tender beef and vegetables in a thick gravy topped with creamy, cheesy mashed potatoes. It’s the ultimate stick-to-your-ribs comfort food! This time of year I really start craving good, old fashioned comfort food. 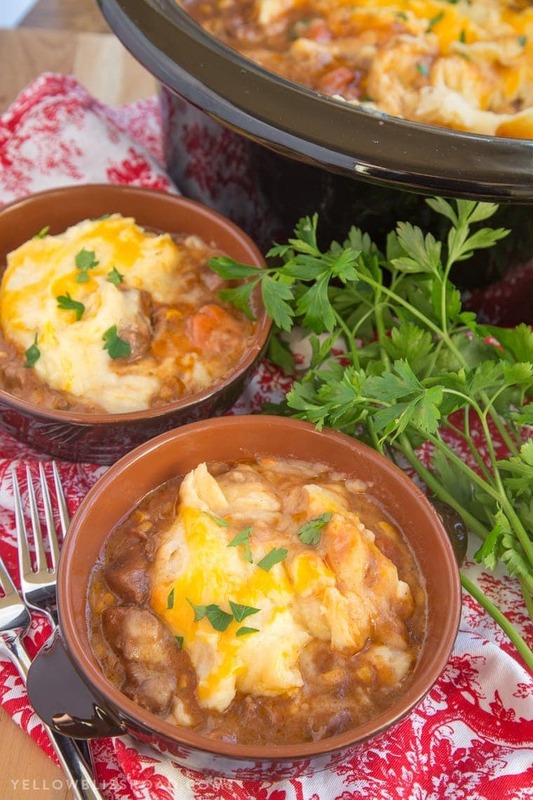 It doesn’t get any better than Shepherd’s Pie! It’s a classic meat and potatoes dish that is easy to make and uses ingredients that you usually have on hand. With the added vegetables, it’s a meal all on it’s own! 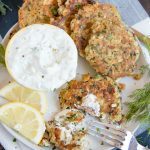 I’ve never seen a slow cooker adaptation of this recipe and I was really excited to try it out. Instead of ground beef, this recipe uses chuck roast cut into cubes like stew meat, which becomes so tender and delicious in the slow cooker. The meat is cooked with some hearty veggies, like carrots and mushrooms, in a rich sauce of beef broth, tomato paste and spices. The smell is glorious wafting through the house as it cooks all day long! The potatoes can be made ahead of time, or about an hour before you’re ready to serve dinner. You can make your own from scratch (recommended) or use frozen or box spuds if you’re short on time. About 20 minutes before dinner, thicken the gravy and spread the mashed potatoes over the meat and veggies, then cover and cook just long enough to heat the potatoes through. Place the beef cubes in a large slow cooker. Top with the garlic, carrots, mushrooms and corn. In a medium bowl, whisk together the beef broth, tomato paste, Worcestershire sauce, oregano and House Seasoning. Pour the mixture over the contents of the slow cooker and stir to combine. Cover and cook on low for 7 to 9 hours, or high for 3 1/2 to 4 1/2 hours, until the beef is tender. To make the mashed potatoes, place the potatoes in a large saucepan and cover them with 2 inches (5 cm) of water. Bring the potatoes to a boil over high heat and stir in the salt. Reduce the heat and simmer until the potatoes are tender when stabbed with a fork (start checking them at 15 minutes). Drain the potatoes, and return them to the pot. Add the milk, butter, salt and pepper to taste. Gently mash the potatoes with a handheld potato masher. Use a large spoon to skim any fat from the surface of the beef and veggie mixture in the slow cooker. In a small bowl, mix the flour and 6 tablespoons (90 ml) water until smooth, then slowly stir the mixture into the slow cooker. Add the peas. Adjust the seasonings to taste with salt and pepper. 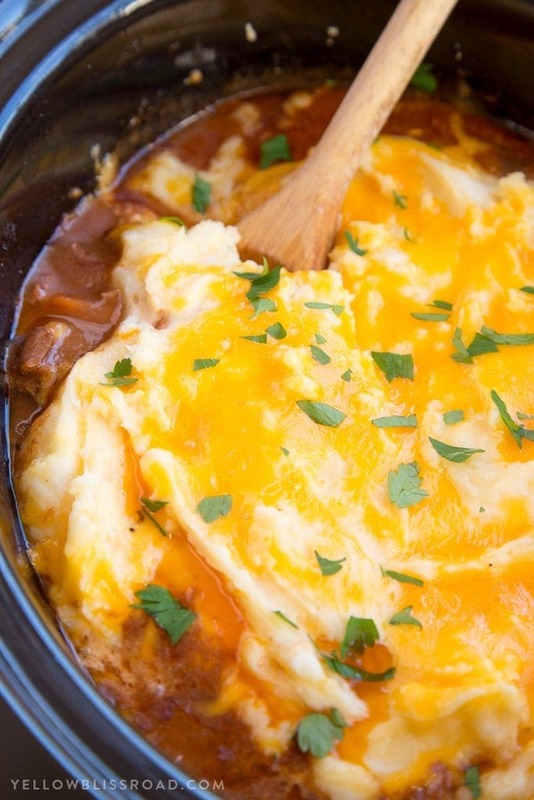 Mix the cheddar into the Mashed Potatoes and spread in an even layer over the top of the beef and vegetables. Cover the slow cooker and cook on HIGH for 15 to 30 minutes, until the gravy is thickened and the Mashed Potatoes are heated through. *Many of the recipes in this cookbook call for House Seasoning. 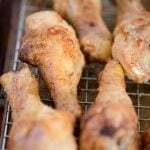 This House Seasoning Recipe is as follows: 1/4 cup fine sea salt, 1/4 cup garlic powder, 2 tablespoons onion powder, 1 tablespoon black pepper. Mix these together in a small bowl and store the House Seasoning in an airtight container. 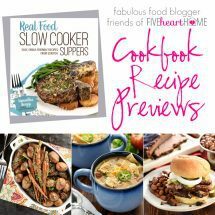 The Real Food Slow Cooker Suppers Cookbook makes an excellent gift for the holidays, or just for yourself! It’s full of 80 recipes that you can make in your slow cooker, including dinnertime classics like Teriyaki Chicken and Swedish Meatballs, new favorites like Raspberry Chipotle Chicken Sliders, Mini Pulled Pork Pizzas, King Ranch Chicken Soup, and holiday favorites like Cran-Cherry Glazed Ham and Citrus Glazed Cornish Hens. This book makes a great gift for the holidays or anytime. Find it on Amazon, at Barnes and Noble or anywhere books are sold. Want to see more recipe previews? Click the graphic below to check them all out! 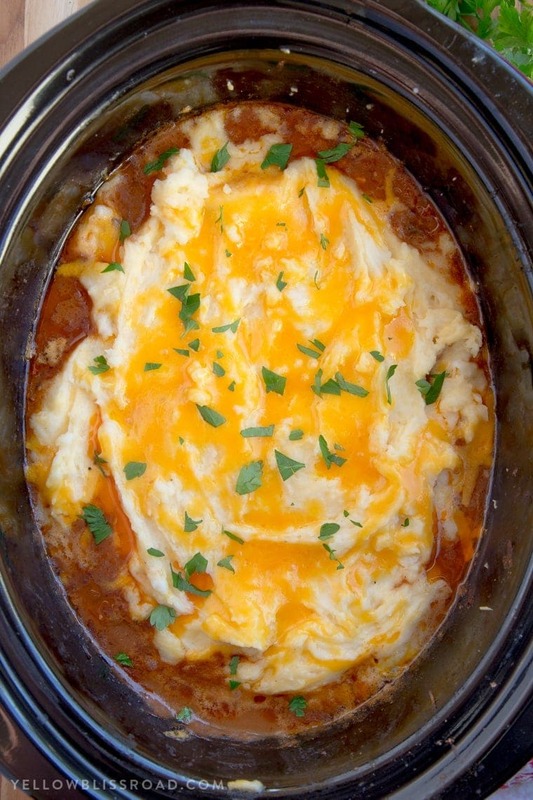 For all Slow Cooker recipes on the site go HERE. Could I make this in the crockpot completely using ground hamburger meat instead? I’m sure you could, but you’d have to cook the ground beef first. how may servings would this be? It makes a lot – 4-6 for sure. Looks like a tasty recipe but it should be Cottage Pie. Shepherds pie is made with lamb cottage pie with beef. Thanks so much for sharing this recipe from my new cookbook, Kristin…you’re the best! And I’m totally drooling over your photos… 🙂 This Shepherd’s Pie would be perfect on a cool, dreary day like we’re having here today. Thanks again for all of your support and hope you have a great weekend! Wow, looks tasty. Definitely going to make this next week. Any ideas on what I could substitute the mushrooms out for? I can get them to eat most vegetables, but mushrooms are a no go. Maybe onion would provide a similar earthy flavor? You can easily leave out the mushroom. Onion would be great in this!